It’s been a long while since I’ve written anything about running. But as February 19th approaches and I’m staring down the Austin Half Marathon, I’ve been thinking a lot more about training post baby. Of course, my first half was post-baby, but Hannah was 6 months old when I first started. But training at 6 months is different than 6 weeks. 1. Hydrate – I’ve talked about this topic before, but I can’t stress how important it is to be well hydrated especially if you are nursing. As a nursing mom, your body is already draining itself. Top that with working out, and your need for water is essential. 2. Focus on Distance NOT Pace – When you’re starting out, don’t focus on your pace, working on your distance. Pace will come. I’m currently running 1-1.5 minutes off my normal pace. And I’m okay with that. Because the more I run, the faster I will become. 3. Make Running a Family Affair – If you can afford it, I highly recommend buying a jogging stroller. We were gifted a double jogger and I love it. We haven’t taken all three kids out yet, but now that Julia’s school has started back, I’ll be taking Hannah and Joseph out for a stroll. 4. Enjoy Yourself – You aren’t racing against anyone else. You aren’t competing against other runners on the street. You are only competing against yourself. So enjoy it. Enjoy running. Run with friends. Run in fun races. Just enjoy it. What workouts do/did you do post-baby? Do you have any races planned this year? *Disclaimer: All tactics/tips are my own personal opinions and not medically backed. Please seek medical advice before starting any running program. 8 Responses to "Half Marathon Training After a Baby"
Great points of advice! 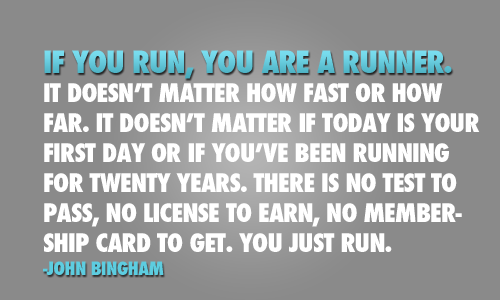 If you cant enjoy running, you wont keep it up! Very true! No since in doing it if you don’t like it. Reminds me of a scene in Back To The Future Part 3. Doc Brown: [mildly intoxicated] In the future, we don’t need horses. We have motorized carriages called automobiles. Barfly 3: If everybody’s got one of these auto-whats-its, does anybody walk or run any more? Barfly 3: Run for fun? What kind of fun is that? I’ve never enjoyed running but always wished I could. Haha! Man, now I really want to see that movie. The third one was my favorite. SO inspiring Sarah, keep up the hard work! I walked and walked and walked my fussy baby to sleep then did 30 day shred twice (about 1 month apart). But, this time I’d love to start running again. Unfortunately I wasn’t in running shape before this pregnancy so it will take much longer and then I’ll most likely miss all the races up here but might look for a few late next summer/fall. Sarah, I’m so excited for you. Wishing you all the best as you get your running shoes back onto the pavement. Keep us posted on your journey. I’m always inspired by fellow runners who blog about their experience. I took some time off running when I was finishing up the writing and publishing details for my book. It’s disappointing to me how quickly the body forgets. Last Friday I went for a run and made it a whole mile. Yippee! (major sarcasm) Then Monday I ran again and made it two miles. So each I time I go I’m increasing my distance again, but it’s irritating to think that in October my body endured 13.1 miles and now I’m huffing and puffing to reach 2!